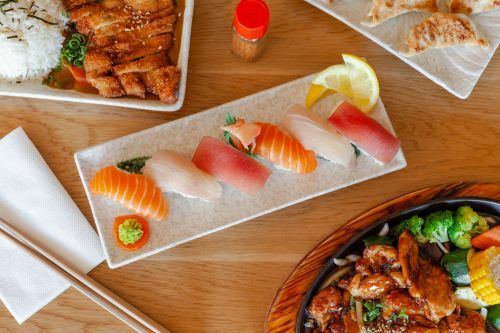 Menulog delivers for Sushi Galore so you'll be able to track your courier on a map. Japanese style crumbed creamy potato cake. Deep-fried Japanese tofu served with light sauce. Mini prawn or vegetable spring rolls. Pan-fried Japanese pork, vegetable or chicken dumpling. Crumbed chicken with mayonnaise or BBQ sauce. Deep-fried octopus served with mayonnaise. Fried crumbed oysters with Japanese BBQ sauce. Fresh seafood and vegetable deep-fried in light batter. Raw beef slices with garlic and wine sauce. Fresh raw tuna slices with Japanese special sauce. Tempura vegetable, yasai croquette, agedashi tofu stir-fry vegetable, miso soup, Salad and rice. Teriyaki beef, katsu, Fried Chicken, Sushi, miso soup, Salad and rice. Teriyaki Chicken, tempura prawn and vegetable, dumpling, Sushi, miso soup, Salad and rice. Teriyaki Salmon, tempura prawn and vegetable, dumpling, fried octopus, Sashimi, miso soup, Salad and rice. Japanese fried rice wrapped in egg omelette with special sauce. Fried tofu and vegetable with Japanese curry on rice. Cooked sliced beef and vegetable with Japanese curry on rice. Cooked chicken and vegetable with Japanese curry on rice. Crumbed pork or chicken and vegetable with Japanese curry on rice. Tofu fried with vegetables in teriyaki sauce served on rice. Chicken cooked with vegetables in teriyaki served on rice. Beef cooked with vegetables in teriyaki served on rice. Fresh grilled salmon with vegetables in teriyaki sauce served on rice. Chicken cooked with egg on special sauce served on rice. Thinly sliced beef cooked with vegetables in sukiyaki sauce served on rice. Crumbed pork or chicken fillet cooked with egg on home-made sauce served on rice. Assorted tempura served on rice. Grilled eel served with home-made sauce. Organic tofu cooked in teriyaki sauce. Beef eye fillet in home-made wafu sauce. Beef eye fillet in home-made teriyaki sauce. Grilled calamari with special sauce. King prawn with garlic sauce. King prawn with Japanese chilli sauce. Fish, king prawn, calamari and scallops. Sliced of raw fish on top of vinegared rice. 6 Pieces = small Sushi, 10 pieces = large Sushi. Fresh variety of raw fish slices. 12 Pieces = small Sashimi, 17 pieces = large Sashimi, 28 pieces = deluxe Sashimi. 14 Pieces = small Moriawase. Vegetable and egg omelette nori roll. Inside out seaweed roll with deep-fried Soft Shell Crab with mayonnaise. Inside out seaweed roll with tempura prawn, cucumber and mayonnaise. Prawn and avocado nori roll with salmon slice. Inside out seaweed roll with cucumber, avocado and chilli sauce with tuna or prawn. Avocado, cavia top, inside out seaweed roll with salmon, cucumber and mayonnaise. Fresh raw salmon and vegetable with mayonnaise. Grilled tuna and vegetable served with sesame and vinegar sauce. Deep-fried Soft Shell Crab and vegetable served with mayonnaise. Assortment of vegetables served with noodle soup. Porterhouse and vegetables with noodle soup. Crumbed pork or chicken and vegetables with noodle soup. Tasty Japanese roasted pork slices served with noodle soup. Crumbed chicken and vegetables with noodle soup. Seafood and vegetables with noodle soup. Assortment of vegetables served with udon soup. Fried Japanese dumpling and vegetables with udon soup. Porterhouse and vegetables with udon soup. Crumbed pork or chicken and vegetables with udon soup. Seafood and vegetables with udon soup. Pork, egg, seafood and vegetables with udon soup. Traditional Japanese paste soup with wakame. Chicken breast in miso soup. Fresh fish in miso soup. Fresh prawn in miso soup.